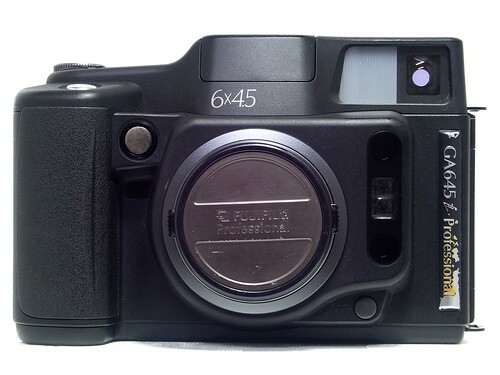 The Fujifilm GA645i Professional is a autofocus medium format camera introduced by Fuji in 1997. A limited 645 series 15th Anniversary version was also available. It differs cosmetically with gold "Limited" script printed instead of "6x4.5 wide". It uses 120 / 220 roll film and captures images in a 645 format. 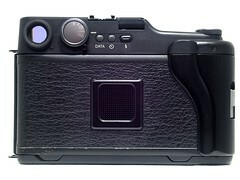 It succeeded the Fujifilm GA645, released in 1995. The body of the camera looks nearly identical to the previous model, but it now supports an additional shutter release button on the face. The GA645i uses a 60mm f/4 lens with a 52mm filter thread. It has a minimum focus distance of 0.7 m. The shutter is electronically controlled with speeds of 2 sec to 1/700 of a sec. but for the aperture range of f/4 to f/9.5 can only go as fast as 1/400 of a second. Smaller apertures can use the faster shutter speeds. A electronic self-timer is available with a delay of 10 seconds. The finder is in a portrait format orientation instead of the more common landscape format. It has bright lines and parallax correction. It has additional information including aperture, shutter speed, focus distance (m or ft), as well as exposure meter information. The exposure system is a center-weighted system using a silicon photo diode. It has a range of 3 to 19 EV (ISO 100). It is not a TTL type system, so exposures using lens filters need to be recalculated. The meter settings supports film speeds of 25 to 1600 ISO in 1/3 increments. Exposure compensation is available and can be changed from ± 2 EV in ½ incremnts. Exposure modes can be changed with the dial near the eyepiece. Exposure modes include (P) programmed auto, (A) aperture priority, and (M) manual exposure mode. Also on this dial is ISO; use the up and down dial on the shoulder to change a majority of settings. Exposure and date time information can be imprinted on the film outside the photo area. The data options include Year/Month/Day, Day/Hour/Minute, exposure mode/aperture/shutter/exposure comp/focus, Year/Day/Hour/Minute and OFF. The year can be set from (19)94 to (20)25. There is a handy built-in pop-up flash with a GN of 12 (ISO 100). A hot shoe is also available to attach an external flash strobe. The GA645i can capture 16 exposures on 120 and 32 exposures on 220 film. The film transport is motorized with a automatic film advance. It also supports fully automatic film loading. This does not require matching the backing paper start mark to a body indicator for first frame loading. The main up and down setting dial can be used to rotate the take up spool for easier leader insertion. Close the back and the camera detects the first frame. Bar coded films is also supported, this allows the camera to detect the ISO speed of the film automatically. A electronic warning beep is emitted on the last frame of the roll. This sound can also be disabled. When the last exposure is complete, the film is wound automatically to the take up spool. A pressure plate is on the back to select between the two formats. Properly setting this plate is essential for 220 film. If improperly set, non bar code 220 film will automatically wind after the 16th exposure. Mid-roll rewind is possible with a button on the base of the camera. A film box top slot is on the camera back to use as a reminder of emulsion type. The camera is powered by 2x CR123A battery. 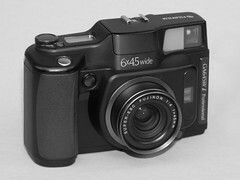 The Fujifilm GA645Wi is another available version sharing a similar body specifications but with a 45mm f/4 lens. A limited 645 series 15th Anniversary version was also available. It differs cosmetically with gold "Limited" scrip printed instead of "6x4.5 wide". Various parts of the camera are gold coloured including the shutter release buttons, hot shoe, mode dial, and lens surround. This page was last edited on 30 March 2017, at 06:39.